The history of shell design practically begins with the introduction of rifled guns in the middle of the nineteenth century as the result of the recommendations of a Royal Commission in 1858. The cannon ball presents no design problems. Spherical shell, said to have been first made at Greenwich in 1543, were little used except for shore bombardments up to the Napoleonic Wars. 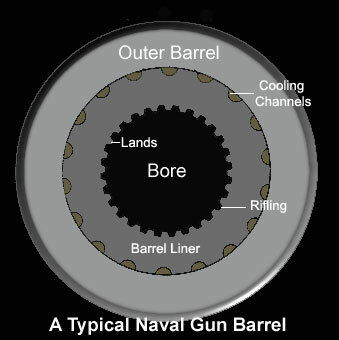 Between 1815 and 1850, however, the 8-inch shell gun firing a 66 lb shell and also solid shot and shrapnel, invented in 1797, was mounted in many ships. In the Crimean War the attack on Sebastopol in 1854 made it clear that wooden ships could not stand up to these shell, while the attack on Kinburn in 1855 showed that armour was a complete answer to them. Cylindrical shell with pointed heads had already been demonstrated in rifled guns in 1850, and following the commission’s recommendations shell rotated by studs were adopted. The first shell introduced were nose or base-fuzed common shell, made of iron and filled with powder. They were about 3 calibres in length and 1.5-2 calibre radius ogival heads. Palliser shell and shot (invented by Sir William Palliser in 1863, for the attack of armour), shrapnel shell, double shell about 4 calibres long, for attack of wooden ships at short range and case shot were also supplied. The Palliser shell were 2 to 2.5 calibres in length, made of iron, the head being chilled in casting to harden it. They were powder-filled but had no fuze, the shock of impact being relied on to set off the filling. Palliser shot were similar, but had a smaller cavity and no filling. These types were supplied for guns of 7 inch calibre and over. Shrapnel shell differed little from those in use up to 1918. In the 1880s the breech-loader replaced the muzzle-loader and studs were dropped, being replaced at first by the Elswick gas check and then by the present type of driving band which had been developed by Krupp and had already been in use abroad for some years. Armour-piercing shell in steel replaced the iron Palliser shell in the 1880s. From that time until 1911, when Lyddite was adopted, the cavity was usually left unfilled, as powder exploded too soon on the heavier armour then in use. Penetrative caps were introduced in Russia and America in 1894, but were not adopted in the British Navy until 1903. Lyddite was adopted for common shell in 1895 and iron was replaced by steel, which had not been used previously as powder would not fragment it properly. The standard length of 3.1 calibres laid down in 1860 was still adhered to at the end of the century, but the head shape of 1.58 c.r.h. laid down at the same time had altered to 2 c.r.h. In 1908, after a series of trials, an 8 c.r. head was recommended on ballistic grounds, but as it was found that with the limits of length imposed by stowage arrangements in existing ships the capacity of common pointed shell would be too small, 4 c.r.h. was fixed as a compromise. This led to the adoption of Firth’s hollow cap, from which developed the separate ballistic cap. Base plates were introduced for Lyddite shell in 1909, and in 1912 tracers were approved. The latter were proposed in 1903 by Semple but the first trials were not satisfactory. Between 1901 and 1910 there was considerable discussion regarding the best anti T.B.D. weapon. After a number of trials it was rec.mmended that common nose-fuzed shell should be used in preference to common pointed, shrapnel or the special light shell which had been proposed. The First World War—and in particular experience at the Battle of Jutland brought some changes in shell types. Piercing shell were adopted for 4.7-inch and smaller guns and the designs of large piercing shell, which were considered to have proved unsatisfactory in action, were further studied. Up to 1918 all shell of this type were proved against plates at normal. It was realised that this did not represent actual battle conditions, and in 1918 tests against plate at 20 degrees, increased in 1929 to 30 degrees, were added. Star shell, which had been developed in 1893 but not adopted, were also ordered, following their use by the Germans at Jutland. At first multi-star designs were tried, but these were superseded almost at once by single star types with parachutes. T.N.T. largely replaced Lyddite T.N.T./B.W.X., Amatol and Shellite were tried, the latter being adopted as the standard filling for armour-piercing shell in 1919. 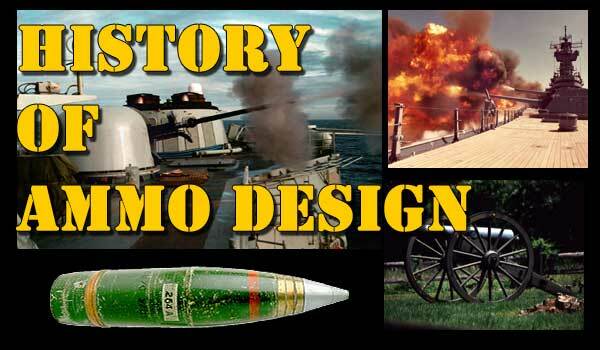 Between 1919 and 1933 there was little change in shell design, research being mainly concentrated on improving the large piercing shell and on the development of smoke shell. Between 1933 and 1939 new shell with nose fuzes of increased weight and improved ballistics for the medium and for the new dual-purpose guns were developed. The Second World War saw the introduction of new fillings—including R.D.X. and aluminised types—base-ejection smoke, target and radar shell, and the 'K‘ device for piercing and practice shell. 3. requirements for satisfactory flight, which may be sub-divided into considerations for drag, stability and accuracy. In these the main consideration is that the shell should penetrate armour and should, after passing through, be capable of exploding effectively. As much explosive as possible (consistent with the strength necessary for penetrating the type of armour that a shell of the given calibre can be expected to defeat) is carried in the armour piercing and the semi armour piercing shell. In the new class of H.E.P. shell an increase in capacity to a good figure for fragmentation and blast is the basis of design and a reduced penetration is accepted, the shell being designed for attack of lightly armoured ships or superstructures. In these penetration is not a requirement, most of them being burst on impact or by a time or proximity fuze, although some are intended to pass through light plating or the skin of an aeroplane. Where the design is not restricted by other factors, fragmentation is the main consideration. More attention is now being paid to blast effect. Shell with fillings for special effects which have been designed include marker, chemical and incendiary shell. The first produces a distinctive burst to mark the fall of shot. The others introduce chemical or incendiary agents into a ship, either by bursting inside it or by a follow-through action following a burst on the plating. Chemical shell might also be required for shore bombardment. Shell not intended for effect against a target. These include base-ejection shell (with : a few designs of forward-ejection) such as star, B.E. smoke, radar echo and target shell. They also include practice proof and drill shell and shot.